This post actually began as a Sevens piece reflecting on Chris Bell’s single “I Am The Cosmos” – that is until I realized we had never discussed the album proper on AD in the past. For shame. For the non Big Star fanatics in the house, Chris Bell was Alex Chilton’s right hand man before splitting after the release of the band’s debut, #1 Record. Like Chilton, Bell was a Memphian with a serious jones for the Beatles and Badfinger. 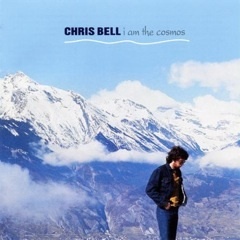 Bell’s pop sensibilties, coupled with the intelligent songwriting and instincts that helped steer the creative direction of #1 Record, very much carried over to his sole LP I Am The Cosmos. A collection of his mid-70s work recorded prior to his death in 1978 (although the single “I Am the Cosmos” was released in 1977) I honestly find myself frequenting Cosmos more often that Big Star’s swan song Third/Sister Lovers. And yes, the John Lennon solo comparisons are completely on point (and in the best way). Lyrically the collection is at times sad, wistful, and reminiscent; as a whole the LP is proof positive that Bell was a master of his craft. For you vinyl hounds, you can now purchase the LP in 180 gram vinyl at Amazon (see link below) or if you’re here in L.A., at Amoeba Music.. Such a great album. Totally worth having the vinyl! Oh lord, I love this song. “Speed of Sound” and “Though I Know She Lies” are great, too. This is on my shortlist of albums that can’t be blogged about enough. I first heard of Chris Bell through This Mortal Coil’s covers of “I am the Cosmos” and “You and Your Sister” from the “Blood” album. Say what you will about Ivo and 4AD, but when he pulled together his pals to put out a This Mortal Coil record, he usually covered some pretty good music. Uber producer/engineer Terry Manning (Zeppelin, Al Green, Cat Power, etc.) was in town last weekend for the annual . While speaking at Ardent (where Big Star cut) he spoke, among other things, about his friendship with Chris and Alex. According to Terry, while Alex received much of the critical credit now being lauded on Big Star’s early albums, that it was Chris who was responsible for bearing much of the creative and technical burden for “#1 Hits” (though some of the lack of credit could be due to fact that most of it came after Chris’s unfortunate passing). The lack of commercial success apparently haunted Chris, who never recovered fully and left the band (though he continued to be actively involved with Alex in the following Big Star release). The resulting emotional loss is borne out in Chris’s solo work you allude to above, which in the end, is gaining him the posthumous recognition he always deserved.